Now running for ten years! This is a very exciting project that came to us from decorative painter and author John Sutcliffe. John's vision for the book is a survey of the colours to be seen on the exteriors of buildings in Rome's centro storico, colours that are very different from those of Venice, Tuscany, or Palermo. If you know our books you will know we love colour, so this was a project that appealed from the outset! Work progresses well. The text is close to being finalised so the extent of the book is now established. John has chosen twenty colours to represent the palette he identified on his fact- and colour-finding trip to Rome last October. Each will be shown on a full page with a large splash of colour painted directly onto the sheet. John has been experimenting with different Italian papers to find one that will satisfactorily take such a large area of paint without cockling unduly. The trick is of course to find one that is also appropriate for letterpress printing the main text. Squaring that circle has proved difficult so at the moment if looks as though we shall be doing the obvious thing and using two different papers for the two parts of the book: a heavier, 200gsm, for the colour patches, and a lighter, 160gsm, for the text. They will both be from the Fabriano mill. The pages carrying the colour samples will be divided horizontally so that it will be possible to view them in pairs, as they can be found on Roman buildings. Now that it is possible to do digital printing onto almost any surface, we are looking at the possibility of exploiting digital technology once again and of having one of John's photographs of a splendidly multi-coloured wall of one of Rome's buildings printed onto the cloth for the binding. As forecast in our last report on the title, we are planning a de luxe edition that will additionally include bottled samples of nine of the basic colours in powdered form, packaged with the book itself in a solander box. Current plans suggest an edition of 110 standard copies at about �0 each and twenty de luxe copies at about �0. But all these numbers are subject to change as things develop. More anon! I see that it is a year ago that I first announced this new title in our series on the history of printing at Oxford University Press. Despite our silence on it since then, this title has in fact been where the bulk of my time has been spent for about the past four years. Detailed research at the Press and at the Bodleian Library has continued and I have now decided on the final shape of this title. There will be three volumes, to be published at about yearly intervals. The first two will trace the development of the Learned Press over the hugely important and formative period from 1660 to 1780. Volume I will cover the resources of the Press, in particular its premises, the paper and type it used, and its organisation. Volume II will cover how those resources were deployed in the process of getting from the author's copy to the delivery of copies to booksellers. The Press and University accounts, Delegates' minutes, and contemporary correspondence and diaries have all helped us to build a picture of working practices and daily life in the larger context of the times. The third volume will concern the Bible Press, the records for which are limited to detailed work records running from 1769 onwards. However, such records are extremely rare, especially for a press of the significance and scale of the Oxford Bible Press, and these have not been analysed before. They provide a unique opportunity to understand the workings of what was essentially a factory for bibles and prayer-books. Firstly they provide us with basic quantitative information about the daily lives of compositors and press-crews; but, by analysing them in conjunction with the books themselves, we have also been able to determine much about the management of the labour that produced hundreds of thousands of volumes every year. Our next step is a review of the text for the first two volumes by some external readers and a final check of the many references to contemporary documents. I am confident that these three volumes provide new insights and understanding of the workings of one of the greatest printing-houses of the letterpress era. They will be in the same format as our previous titles on OUP, and Monotype Van Dijck will probably be the typeface, printed on Mohawk. There will also be de luxe editions, in quarter leather with a slip-case: I expect that volume I will be accompanied by an extra volume of hitherto unpublished correspondence between the Press and the London paper dealers in the 1670s, and that volume II will come with a portfolio of leaves from books from across the period. It has long been an ambition to visit Japan and this year we made it, spending three weeks touring with friends. Kabuki, sumo, geishas, sashimi, sushi, onsen (baths), shinkansen, ... we tasted pretty much most things (though we skipped Noh). And of course paper making. 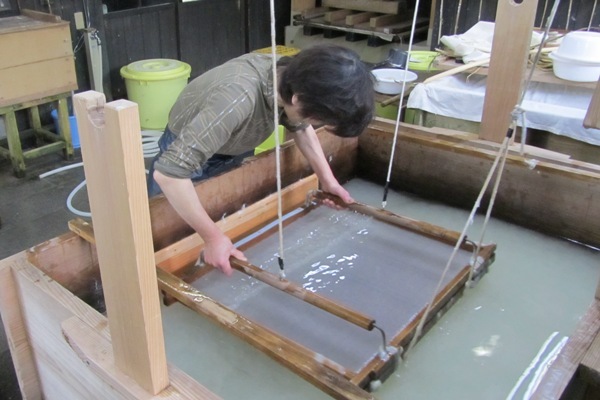 We took in a visit to the Echizen washi village where they demonstrate (see below), and to Tsumago in the mountains where there are also small mills. We saw fine exhibitions of ukiyo-e - Japanese woodblock prints - by the great masters, in particular one of Hiroshige's Fifty-three Tokaido Stages at the extraordinary Hikaru Memorial Museum in Takayama, and another of Hokusai and Keisai Eisen at the Japan Ukiyo-e Museum in Matsumoto. Finally a visit to the Haibara paper shop in Nihonbashi in Tokyo. That was an eye-opener: looking at some samples of HMP I thought they were a tad expensive until I found out that the price I was looking at was for 100 sheets. I should have bought another suitcase and loaded up. Next time perhaps. 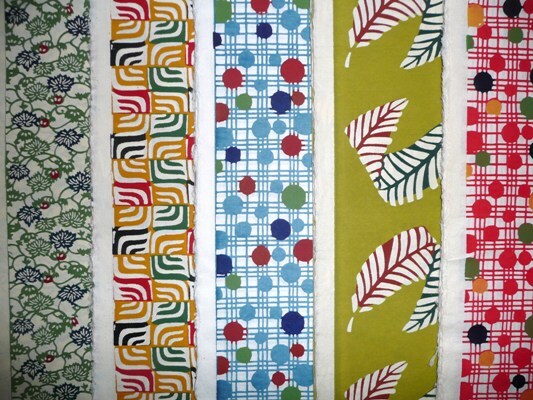 Anyway I came back with 200 small sheets of some nice kozo paper and some splendid pattern papers. Now for a text! Grateful thanks to the paper-makers for permission to photo. You can find out more here.